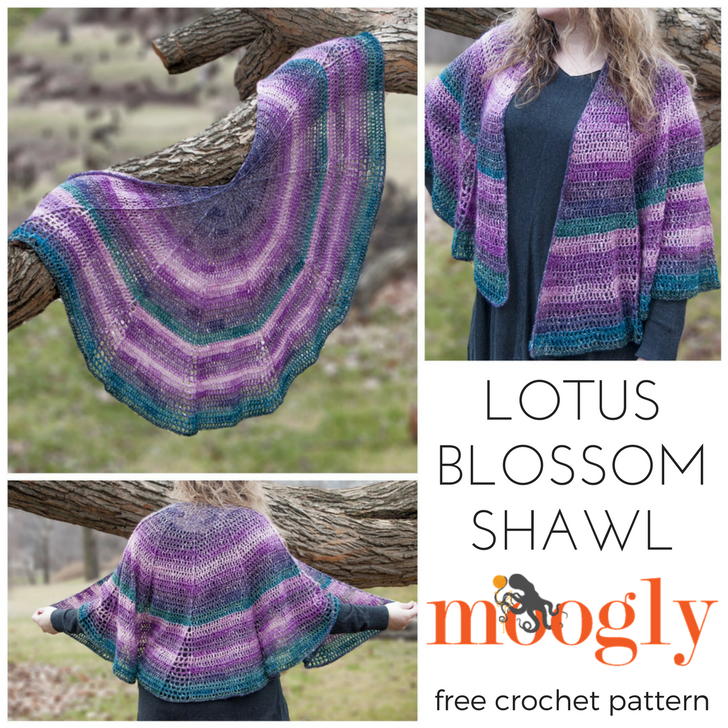 Lotus Blossom Shawl - Free #Crochet Pattern on Moogly! The Lotus Blossom Shawl features a unique shape that makes it both easy to crochet, and easy to wear! 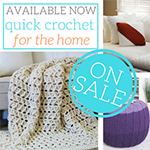 This 3/4 circle might remind you a bit of Pac-Man – and it’s this shape that makes it stay put over the shoulders, keeping you securely wrapped in crochet love! It starts with a magic circle, but after working only 9 double crochets in the ring, you turn to work in rows. Most double crochet circles begin with 12 stitches, so we establish the 3/4 circle right off the bat. As you work the Lotus Blossom Shawl pattern, you’ll see that these 9 double crochets form the borders of 8 wedges of pattern, making for easy repeats across each row. Inset sections of mesh between the wedges create additional shaping and a light, springy feel! I thought about calling this the Hitchhiker shawl since it has exactly 42 rows… but of course, that name belongs to a lovely knit pattern that’s been around for a while now. So instead, I took inspiration from the colorway itself! 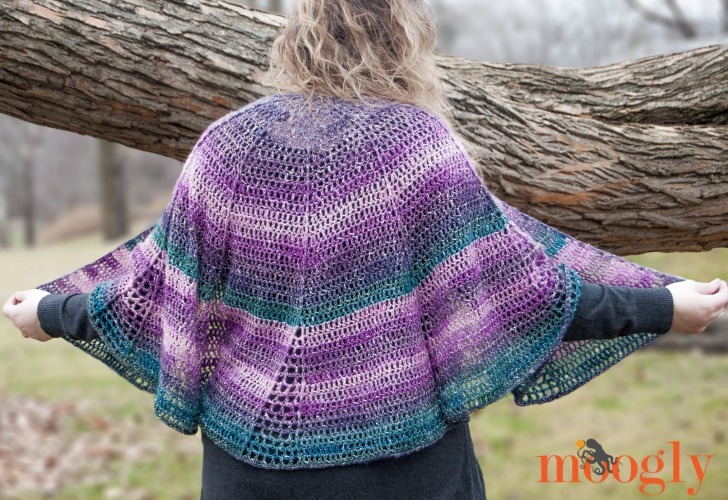 This shawl was made using Lion Brand Shawl in a Ball Metallic in Lotus Blossom – a gorgeous self-striping yarn of purples and greens and a bit of blue, depending on the light, with sparkly thread run throughout. 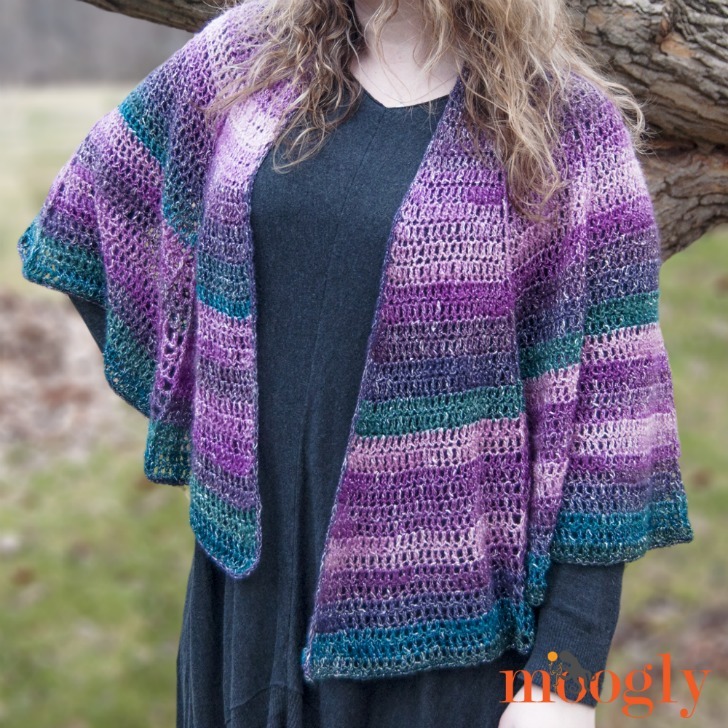 It’s stunning, but I know any Shawl in a Ball colorway will look great in this pattern! 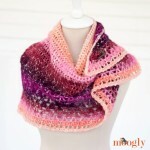 Pick up 2 balls of your favorites and you’ll be ready to make this free crochet shawl pattern! Row 42/Border: Ch 1, sc in each st and ch sp across Row 41, work 2 extra sc at the corner, (sc, ch 1) in the side of each row across the top 2 (straight) edges, 2 extra sc at the last corner; join and break. 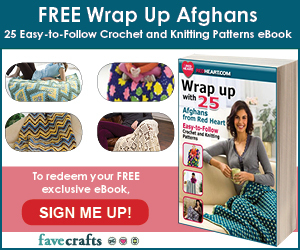 And that wraps up the pattern for this free crochet wrap pattern! 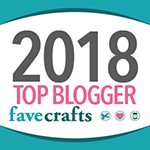 It’s fun to make and cozy to wear and perfect to gift – I hope you enjoy making your own Lotus Blossom Shawl! can I make this without the mesh sections? Can this pattern extended for a longer fit? Hi Janine! Yes, each pair goes in the same stitch – work a fpdc around the post, and the dc under the top two loops. 🙂 The first half of the row you work the fpdc before the dc, so that the fpdc is on the right, and then on the second half of the row you work the dc before the fpdc so that the fpdc is on the left. I hope that helps? Thanks after rereading the pattern I finally got it ? 😀 Oh good! Thank you Janine! Great pattern! Line 26 seems to have a typo, I think it should have 23 dc instead of 24. Is that right? The stitch count there is 24, because in the previous row you have “2 dc in the next st, dc in the next 22 sts” for a total of 24 sts. Then, in Row 26, you don’t increase in that section, so it’s just dc in 24. Does that help? Ah, I see. That makes sense. Thanks! Oh good, glad you got it! 😀 Thank you, I hope you’re enjoying the pattern! I’m confused on row 26, will my front post be one stitch over? When I count out 24 it moves over one and then there are only 24 at the end instead of 25. Great question Melissa! 😀 Okay, so what I did was wind off a bit to get to the same color as I finished in. It wasn’t the same place, exactly – closer to the beginning of that section than where I ended the first ball – but it worked! 🙂 Then you can set aside the part you wound off and add it in later if desired in that section. I found I had enough to finish the shawl without using that part though. 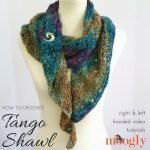 Hi, I’m wondering if this is worked with 2 strands of the shawl in a ball? Am anxious to start this but the yarn seems a bit thin to be using one strand with a K hook. Thanks and I can’t wait to get started. Am using a single strand of the shawl in a ball. Am at row 18. Should the pattern repetition be 5 times? Why not 7 like the rest of the pattern.? You only get 101 stitches with the repeat at 5 times. Typo? Yes! My apologies, I’ll get that edited here now. Thank you! I love how this is turning out. Hi I’m confused about the border, row 42.. it says ch 1 in each stitch and the chain spaces across row 41, work 2 extra sc at the corner, (sc, ch 1) in the side of each row across the top 2 (straight) edges, 2 extra sc at the last corner. My confusion starts at “work 2 extra stitches at the corner…” and from there on. Are the mesh sections the corners? Can you explain a little more from where my confusion starts to the end please? Thank you so much! I love how this looks! Hi Cathy, and thank you! 🙂 The corners would be the first and last stitches of Row 41. Does that make sense? Yes I finally realized that I am taking the border up the sides and across the top! Thank you for your help and I love your pattern! Yay I’m glad it’s clear now! 😀 Thank you! Hi! Love this pattern! I have DK weight #2 that i would love to make it with is that possible? Closest gauge I got was N hook and 7 inchs looks real loose.. Thanks! Thanks for your help, I just learned to crochet in December so I’m a beginner just learning how to follow patterns! Everyone loves this one I just completed in shades of teal and blues. Now I have to find another project! 😀 Thank you so much Suzanne, I’m so glad you like it! Hi, Tamara. I just started on this shawl , I’m at Row 5, and have a question. I wonder if you could give me some advice. I love the pattern, but it’s worrying me that the shape of my shawl so far is not a 3/4 circle as you described, but more like 7/8 of a circle, a Pakman indeed. The stitch count at Row 5 is 41, as per pattern. Let me know if you have any advice. At this rate, the finished shawl will probably be a wrap around kind of circle. Thank you in advance! Love your designs! From your description, it sounds like your gauge width is wider than mine. If you’d like to reduce the width a bit as it goes on, you can omit some of the increases, and then block the edge straight. 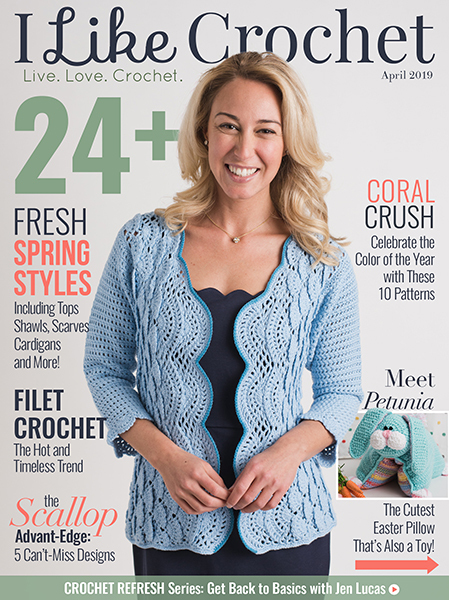 Hi Tamara — I just wanted to say “Thank You!” for excellently written patterns. It is so nice to be able to start a pattern knowing that I am not going to have to stop and redo a pattern because it doesn’t make sense as written, or is not edited so has mistakes, etc. 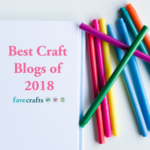 Your blog and patterns are always so professionally put together & I really appreciate it. I am using this pattern with some old ticker tape ‘yarn’ that I have had stashed for years while I try to find a round bottom shawl. I have had this particular pattern bookmarked since you published it. 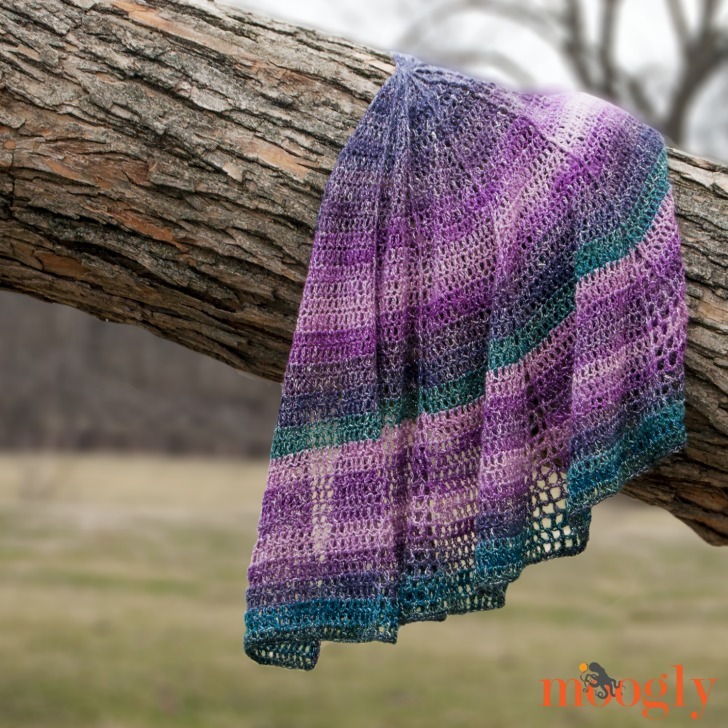 I’m working on gauge now and can’t wait to have my shawl. 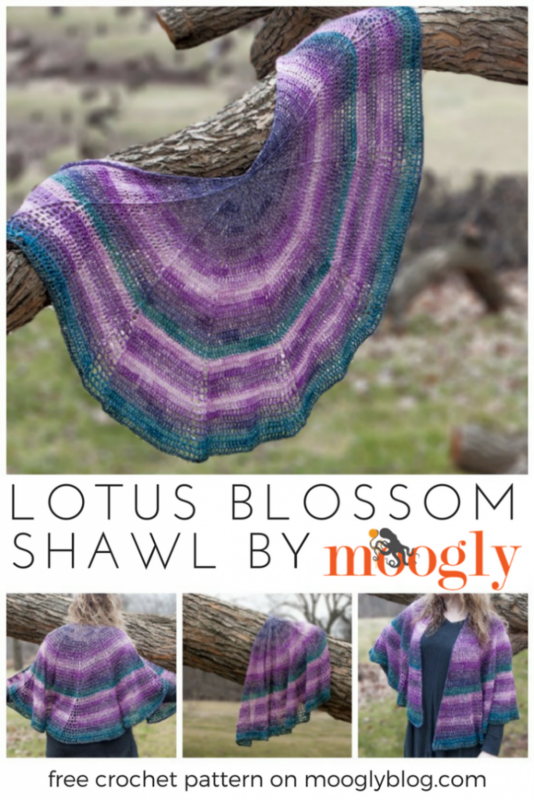 May I have permission to make a copy of the lotus blossom shawl pattern for personal use? 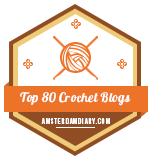 Tamara thank you for another great pattern. I just finished this shawl using Lion Brand Shawl in a Cake. Love how it turned out. I make the inserts using dc instead of chains. Love how it looks.